These come with or without snares. The hand lever on the side can adjust snares to the sound you want. Durable, but beautiful, with a great sound. Notice on the box/sitting cajons there is a switch on the player's right-hand side. This controls the snare, which can be adjusted all the way from a full-sizzle to Flamenco with clear, warm resonance and deep bass. 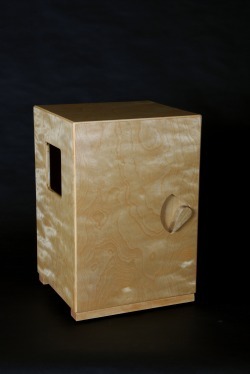 All PMPercussion cajons are built with lock miter joinery for maximum strength, durability, and acoustics. The shells are 12mm 9ply American Birch plywood. The tapas are 3 mm 5ply Birch. The playing corners of all cojons are rounded for player comfort. 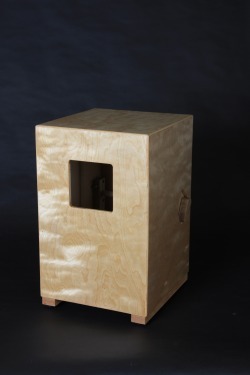 The smaller instrument on its side is a bata cajon.